Economic cost goes beyond the pure monetary value of a course of action or economic decision. In addition to the difference in monetary value, economic cost also considers the lost opportunities. This is where the other term for economic cost comes from: opportunity cost. Opportunity cost is the difference in options—in other words, what you are passing up when choosing one option over the other. When describing the cost of a course of action as an alternative, the concept becomes even more theoretical. This is because the number of options goes as far as the imagination can go. However, economic cost is still an important aspect of practical economics. It is one of the basic concepts in economics and applied constantly, even when you are not reflective of the opportunity costs involved. Take a look at the following examples. Each one is an example of economic cost, but at different scale levels. The mode of transport that you choose to get to work is an example of economic cost. Let’s say that you have three transportation options to get to work. With each option, there is a monetary cost. The monetary cost of option A is the cost of fuel and for option B it is the price of the ticket. Option C is free, in monetary terms. However, the difference in monetary cost is not the only cost associated with each option. There is also the economic cost of time. Cycling to work will take the longest, but there is no risk of getting stuck in traffic en route to the office. Driving the car to work is potentially the fastest option, but traffic is unpredictable. The travel time by bus is only four minutes longer than by car, because the bus is allowed to drive in the express lane. However, taking the bus requires a 5-minute walk to the nearest bus stop from your house, and another 3 minutes from the bus stop to the office. The difference in travel time for each option is only a few minutes. However, those few minutes can also be spent on other routines—like drinking a cup of coffee, watching the news, or snoozing for a few more minutes. The economic cost of each travel option is a balance of price difference, time spent on travelling to work, and time that could be spent doing something else. A t-shirt printing business uses two methods to print on the t-shirts. Once involves attaching a cloth sticker, while the other involves embroidering the text or image. The business wants to increase production of one of the methods. This means either hiring more staff that can work the sewing machines, or purchasing a machine that can attach the cloth stickers at a faster pace. The difference in the required budget for each option is inconsequential. However, the current budget does not allow for investment in both production methods. The economic cost of either choice is the cost of foregoing the other option. Government agencies will often publish reports that explain the economic cost of socioeconomic situations—examples are the economic cost of an ageing population or the economic cost of investing more into education instead of subsidies for SMEs. Such reports attempt to put a monetary value on the socioeconomic trends, but also illustrate the socioeconomic impact in the short- and long-term. Below is a graphic example of macroeconomic economic cost. 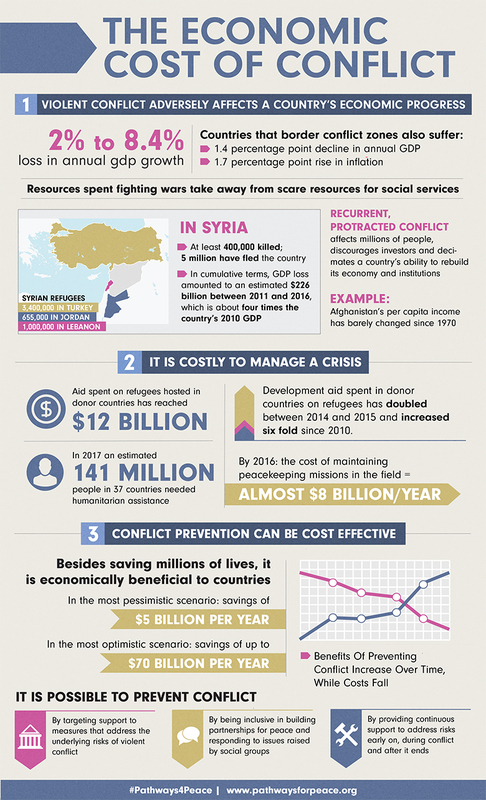 It was put together by the World Bank to illustrate the economic cost of conflict. Note that the above examples are not exhaustive. Aside from the opportunity costs mentioned, other opportunity costs could apply too. 1. Does the balance sheet of a business give a complete picture of all its economic costs? A. Yes, an accurate balance sheet takes into account all costs and profits of a business. B. No, a balance sheet only takes into account monetary costs and profits, not its economic costs. C. No, a balance sheet only shows the economic costs for a short period of time. 2. Consider the above example of economic cost in business. For the given business, which of the following is not a factor in the economic costs of either choice? A. The time needed to train new staff. B. The depreciation of the current machinery. C. The marketing campaign of the business. 3. Which of the following statements is not an example of economic cost? A. An opportunity cost of going to university is not earning money at a full-time job. B. 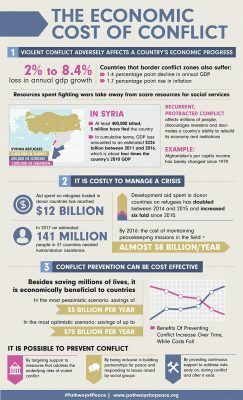 The difference in GDP due to an outbreak of cholera is part of the economic cost of inadequate cholera prevention. C. Both are examples of economic cost.